From the Erie Canal to the interstate highway system, infrastructure has always been at the heart of New York’s economic success. Yet today, the infrastructure that built our great economy has fallen into disrepair. Louise believes fixing our nation’s infrastructure must be a top priority in order to remain competitive in the global economy. Our country’s infrastructure earned a near-failing D+ from the American Society of Civil Engineers. If we are to maintain our global competitiveness, we cannot afford to fail at something so critical to our economic success. That’s why Louise supported a plan to leverage private funding and investments in critical infrastructure improvement projects across the country. Louise also co-sponsored the Stop Corporate Expatriation and Invest in America’s Infrastructure Act, which would close corporate tax loopholes and direct those funds toward the maintaining our nation’s most critical infrastructure. We need long term solutions to fix these problems, not just stop-gap plans. Louise has been the leader on development of Rochester’s Intermodal Transportation Center, which will serve as a hub to connect our new train station, with existing infrastructure for cars, bikes, and buses. Louise secured more than $18 million in federal funding for this project, and construction is now underway. The Inner Loop is expensive to maintain and has separated neighborhoods, stalling the city’s economy. 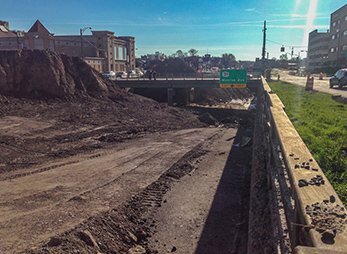 Bringing the eastern section of the Inner Loop to grade by filling it in will bring Rochester back together, create new space for businesses, and create thousands of jobs while saving money on costly bridge repairs. That’s why Louise secured $17.7 million in federal support funding to get it done and construction began in November 2014. One of Louise’s top infrastructure priorities is improving passenger rail service to Rochester in order to improve commerce, generate tourism, and help grow our regional economy. We need to repair existing tracks and create a third rail dedicated to passengers that will allow families and business travelers to get around the state more efficiently. Louise has also long advocated for high-speed rail to connect Rochester with the rest of New York. That’s why she founded and co-chairs the Congressional High-Speed and Intercity Passenger Rail Caucus. After arriving in Congress, Louise Slaughter was able to get Rochester added to the Federal Aviation Administration’s priority airport list, which secured bonds for the airport from all major airline carriers. Since 2007, Louise Slaughter has secured $27 million for improvements to the Greater Rochester International Airport. The improvements, which include rehabilitation of runways and taxiways, are making it easier and safer to travel to and from Rochester. Louise has also successfully convinced airlines to bring more service to Rochester, creating new flight options, and helping keep prices affordable. The Corner of Pitkin St and East Ave today. Louise secured $17.7 million in federal support funding to bring the eastern section of the Inner Loop to grade. 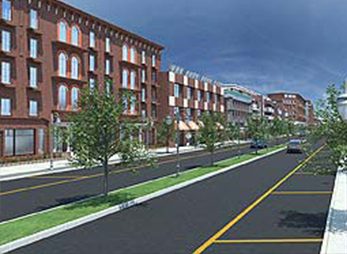 A rendering of the completed Inner Loop project.